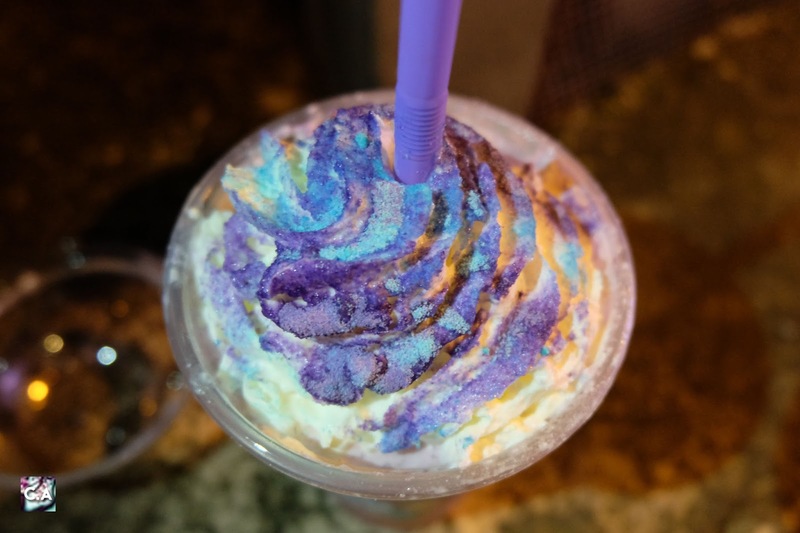 Although Starbucks Unicorn Frappuccino frenzy is over three months ago, there are few people didn't get our hand on it specifically if you stay in Malaysia. I'm not sure why but its really hard to get our hand on something that have become a trend outside of our country (maybe..we are not the one that set the trend). Thank god, there are some people here grab the opportunity to be part of this, I would say the most anticipate trend of the year. But, the main question is does it taste good? I know the existence of Malaysia Unicorn Frappuccino from my Facebook wall and with all the pictures and such it get my attention. To be exact honest it just because they have tons of purple colour! (my favourite colour). Since then, I saved the post and waited for the right opportunity to taste it. WHERE TO GET THE UNICORN FRAPPUCCINO? So far that I know, this drinks are only available at TAPAK Urban Street Dining, Kuala Lumpur. Take note that TAPAK are open daily from 6 PM until Midnight. 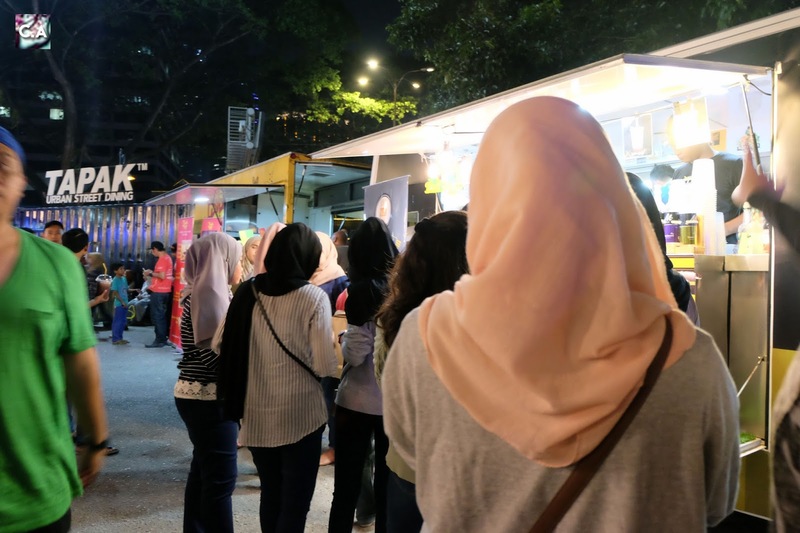 Located at a busy street, you don't have to worry because they provide a pay parking space for RM3 (price when you park after 6PM) at Legion Parking, Jalan Ampang. Make sure to look out for Summer Big Cup & Supplier truck around the area and I'm pretty sure you will see in just a minute! The line are pretty long at Summer Big Cup & Supplier truck. Make sure to que because I was so excited and was not seeing any line from my point of view. End up, there are actually quite a long que. So, I get in the line and the most frustrating is when I arrived, the staff said that they taking a break from making the frappuccino because of the machine need some time off. It was almost 11 PM at that time (yesterday, 8/7/17). So, I was like getting gloomy and decided to come back after 11.30 PM since the staff said they will start making those again around that time. THEY SAID IT'S ALREADY SOLD OUT! I was like 'nooooooooooo' but then I approached the staff myself and said I was here earlier and ask if they can make one last unicorn frappuccino for me. OMG! You know what, she said YES! (my sad innocent face work 😜 ). 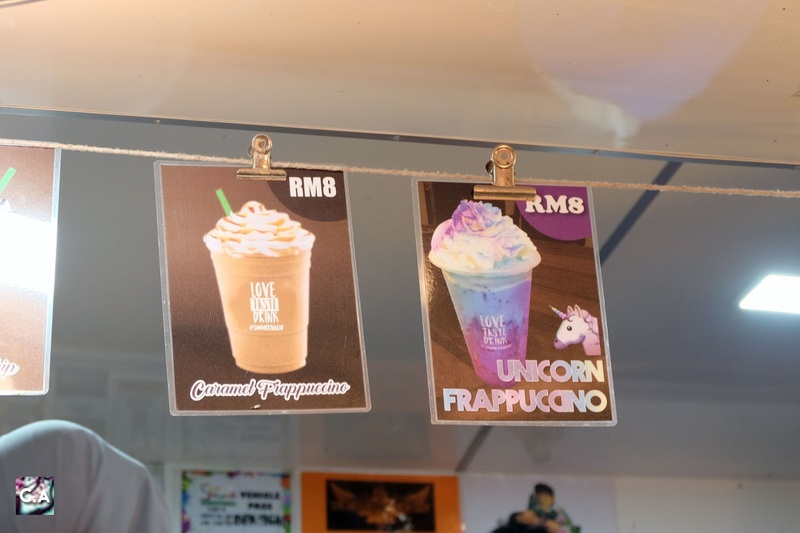 Price for Unicorn Frappuccino is RM8 only! HOW WAS IT TASTE LIKE AQALILI? After I get it, I decided to give it taste after taking some photos but I couldn't resist so I take a bit of sip, then I give it to my mom and my younger brother. 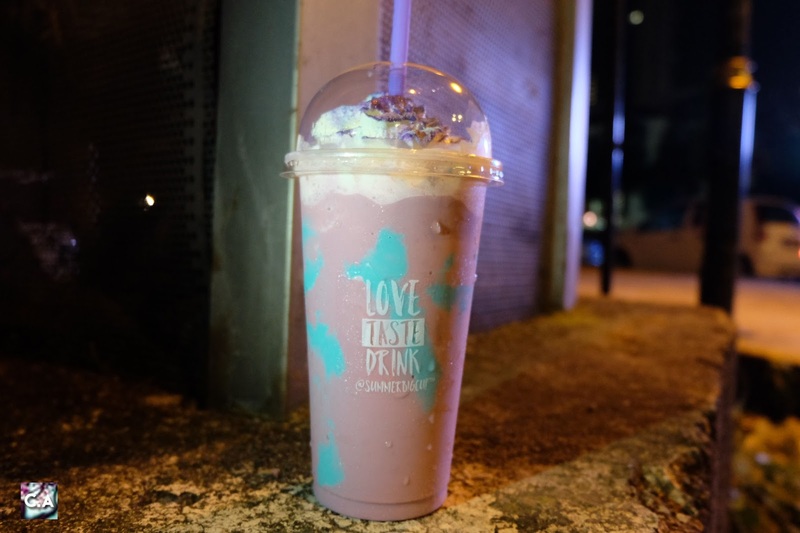 Just wanted to make it clear that they advertised this as "unicorn mint frappe", you shouldn't expecting a really fruity drinks like the original unicorn frappuccino. To be honest, it was disappointing. Why Lili? It looks so beautiful! Yeah, have you heard english idiom "don't judge a book by its cover"? If yes, one extra point for you. 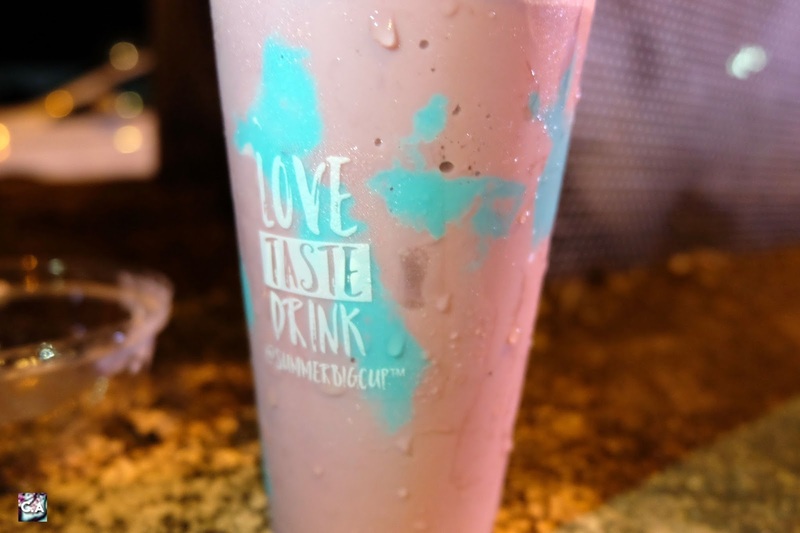 I was attracted by the pictures, and that's why I want to make sure it also taste good so you will get both looks and yummy drinks. Up closed on the art of Unicorn Frappuccino. First sip of this drinks get me so confused because it taste like a medicine and it also leaves the same aftertaste. Okay, so I try to be positive and taste the cream with blue and purple powder, it taste the same. The mint flavour was not overwhelm and I think it should be the main point since they advertised as it is. Other than that, for the price point it was 'okay' for me to grab one plus it was not sweet at all, so that's the only positive comment that I can give to you. Would I repurchased it? I don't see myself getting this again for the future. But I would like to buy this one more time just to confirm the flavour, was it still the same taste that I get on the first time. If you want to try it, go ahead! Don't let my comment affect you to achieved your dreams because it's different for every people. For more info, make sure to check out Summer Big Cup & Supplier. Cream with blue and purple sprinkles! Thank you for spending your time reading my blog! It mean so much to me. Before that, don't forget to SUBSCRIBE to my email list on top of the page, to be the first one to receive updates from me! aaah yang viral haritu. Itulah dissapointed juga lah, cuba akak rasa nanti tau, bgthu okay tak rasa dia. Now that I am back from Vietnam, I can boast all about the amazing time I had there all thanks to this amazing tour guide service there! You can click here to learn all about it. I am sure you will not regret hiring them.